Roger and I wrote a book! We’ve posted all the errata we know about on the AMS web site. You are cordially invited to let us know of other goofs we’ve missed. Thank you! 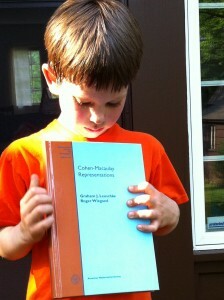 This book is a comprehensive treatment of the representation theory of maximal Cohen-Macaulay (MCM) modules over local rings. This topic is at the intersection of commutative algebra, singularity theory, and representations of groups and algebras. Two introductory chapters treat the Krull-Remak-Schmidt Theorem on uniqueness of direct-sum decompositions and its failure for modules over local rings. Chapters 3-10 study the central problem of classifying the rings with only finitely many indecomposable MCM modules up to isomorphism, i.e., rings of finite CM type. The fundamental material – ADE/simple singularities, the double branched cover, Auslander-Reiten theory, and the Brauer-Thrall conjectures – is covered clearly and completely. Much of the content has never before appeared in book form. 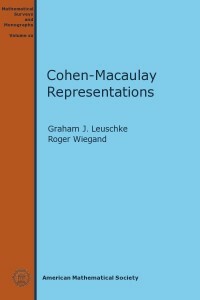 Examples include the representation theory of Artinian pairs and Burban-Drozd’s related construction in dimension two; an introduction to the McKay correspondence from the point of view of maximal Cohen-Macaulay modules; Auslander-Buchweitz’s MCM approximation theory; and a careful treatment of non-zero characteristic. The remaining chapters 11–17 present results on bounded and countable CM type and on the representation theory of totally reflexive modules.